Tasty Baked Fruits for Baby Food Recipes | Yummy Baked Apples, Baked Peaches, Baked Pears for Baby Food and more! Have you ever baked a peach or baked apples or pears? If not, then now is the perfect time to give it a try – your baby will thoroughly enjoy the tastes! Baking fruits brings out their natural sweetness and also makes for a nice soft fruit. Baking fruits will give you a warm naturally yummy treat. You may eat the baked fruits in a variety of ways from the simple to the garnished. Below you will find information on how to bake fruits for tasty homemade baby food and even for the big kids too! Place fruits “face down” and bake at 400F for approx. 40 minutes or until skin puckers. Add raisins and a wee dash of brown sugar if desired too. Bake at 400 for approx. 40 minutes or until skin puckers and/or fruit begins to bubble. You choose the temp and keep a watch. We use 400 for approx 10 minutes. Pears are generally more soft so keep a watch as they may bake up faster than you realize. 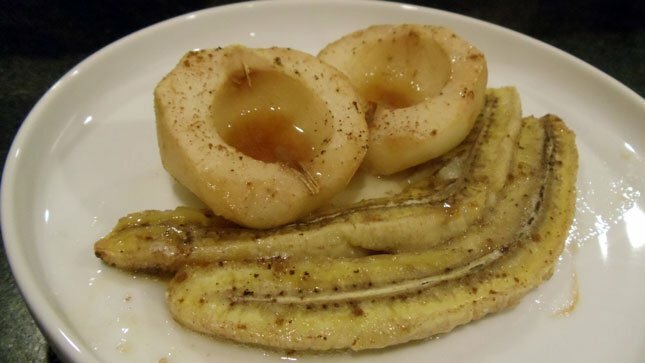 Bananas are also yummy when fried in a dash of butter on the stove top – sprinkle with cinnamon and drizzle with honey if age appropriate. Pears are very yummy when lightly fried with a touch of vanilla. Once your fruits have been baked you may serve them in a variety of ways. Slip skins off and purée – serve alone or blend with other fruits, veggies like acorn squash and sweet potatoes or even blend into meats and cereals. Blend into warm brown rice, add yogurt and mix – Instant rice pudding. Serve baked apples in a bowl surrounded by frozen yogurt with maple syrup or honey drizzled atop (over age 1 year old). Serve baked apples plain with a spoon – Instant snack in its own bowl.